The Mac mini - What Display to Choose? The Mac mini Size + Form + Quiet = Mi Musica! PR: TechnoWarehouse LLC has announced a new price for the 466 MHz processor upgrade for tray-loading iMacs. This powerful upgrade is now reduced to only $199 ($50 less), and the rebate for a working CPU card is $15. iMac users can enjoy the superior performance of a 466 MHz PowerPC G4 CPU. This G4 upgrade boosts iMac performance to allow any Mac OS from 9.x through 10.3, without drivers. The original iMac CPU was simply not powerful enough to run any version of Mac OS X. This G4 processor upgrade has 1 MB of backside cache running at half the CPU speed, so not only do customers get a numerically greater processor clock speed, they also get double the cache memory. The result is a 2.5 times improvement in system speed. This user-installed upgrade come with a one-year warranty. "It's very exciting to provide a Mac OS X solution to the millions of original iMac customers. We have hundreds and hundreds of satisfied iMac customers who are running more demanding applications from video editing to graphic design, using the power of this popular iMac processor upgrade," said Jack Putnam of TechnoWarehouse. "It's been a long time coming. Hands down, Apple's Mac mini with Mac OS X Tiger owns the low end. No, Apple won't sell more Mac mini's than eMachines or Dell will sell low end boxes. "What you get with the Mac mini vs. what you get with even low end home-built PC systems is remarkably different. "Low end (meaning, low cost and powerful) and ultra cool are combined in one very powerful and appealing package. Here's why." "I ordered a Mac mini in mid-February to serve as a replacement and companion for my iBook G3 and work-issued iBook G4. I opted to get the 1.42 GHz model with some upgrades (512 MB RAM, SuperDrive, AirPort, Bluetooth). With a display, keyboard, and mouse already available, I fit Apple's target mini demographic perfectly. "After weeks of waiting, the mini shipped via FedEx direct from China and arrived last Friday. I was astonished at not only how well-packaged it was (after opening the boxes for various Macs from the aforementioned iBook to eMacs, I've always been impressed with Apple's attention to details), but also how much smaller it was than I had imagined." "The Mac mini is about as close to perfection as a budget/home PC gets." "Using all the know-how gleaned from the iPod mini and its range of delectable PowerBooks and iBooks, Mac has done it again. "Only this time the product given that ever-shrinking treatment is a desktop called the Mac mini. "The wee mini comes in several versions, but shared by each is a sleek, minimalist chassis that is 5cm high and a modest 16.5cm square. "Within this brilliant piece of industrial artifice, Apple has crammed all the bits and pieces that make up a complete computer." "The only low to medium end Powermac device I have not parried with is the 20" iMac G5 I have been waiting for the rumoured changes and so far here, they are not being exhibited. But next month it may be different, who knows but that wont make any difference to the smallest in the family, the Mac mini, if you don't count the iPod's. "With a passion I do still reflect on the great eMac that was at the time everything I had wanted in a low end desk top. "To eulogize the eMac is difficult, but now when there is a Mac mini in its place perhaps a lot easier. The only thing to save the eMac I felt was the advent of the Mac mini and the continual need in business and education to have a reliable and reasonably damage proof shell obviously a faster processor would help eMac longevity." "So what does interconnective really mean for an iDevice like the Mac mini? "I had been searching though my old research database for Internet connectivity and came to an excellent few links that point to the direction of iconnectivity. "There is a huge potential and real style and scope in the interactive connections plug and play possible through the many networks and the gateways even now at our disposal." "The academic argument for houses that are designed and discreetly networked is readily available on thousands of web sites and in the halls of academic opinion, but what exactly are we talking about. Well we are looking at the current surge in embedded appliance technology since 1999 which has change the way in which many think about their daily life patterns. "...The Mac mini can have media centre applications...."
"There are a number of characters and factors which make me appreciate my Mac mini. My music, 'Mi Musica'. In 1969 I went on rather a long journey which took me via San Francisco and LA to take a Pan Am to Buenos Aires, Argentina. "It was an Architects congress which the University sent me to as an international delegate. I mention this because I was an Auzzie so far from home, in a strange environment, but on the train station on the way back from Ma del Plata one of the young Argentinean Architects sporting the then popular handle bar drooping moustache, was carrying his guitar. I said, "why bring that along" and he replied, "I have to have my Musica". Here is me an Australian carrying a portable tape deck and a small transistor radio and I could not understand what he was on about, but when we sat in the train his guitar and songs came out and they were superb so superior to my canned low quality music. "So with my Mac mini, I have to have my music, and the quality is superb just as it was in a train on the way back from Mar del Plata. So why is it so good?" "Well for one thing the Mac mini is whisper quiet...."
"I have never had a more seamless or more effective restore from one computer to another." "The Apple Computer Mac mini is a cute little box with a fast processor and a slow performing hard drive. I thought it would be interesting to see how performance might be improved if I installed a 3.5" 7200 RPM hard drive on the ATA100 IDE bus of a Mac mini 1.42 GHz. The Mac mini in these tests has 512 MB of memory installed and I have removed the internal DVD and 2.5 inch hard drive in order to attach an adapter that allows the Mac mini to accept one or two 3.5 inch IDE hard drive(s) instead." PR: The Plasticsmith has announced the release of its newest Mac mini accessory, the mini Shack, designed exclusively for Apple's Mac mini. It is the first stand to incorporate a hub. The mini Shack:glo sports a blue LED illuminated base crowned with a white acrylic housing that shelters a built-in 7-port high-speed USB 2.0 hub and provides space under the hub for cord management. The USB-powered blue LED features a convenient on-off switch. It matches the lines of the mini, complementing the mini's unique design. It is available, as well, in LED white glo $69.95 introductory price; $79.95 as of June 1st. For those who prefer transparency over a blue hue, the mini Shack:clear is identical in size, design and built-in hub, however it provides an alternative to the look of the blue-glo, with a light-reflecting acrylic base. Clear $59.95 introductory price; $69.95 as of June 1st. Finally, there is the humble mini Shack: "BYOH" (Bring Your Own Hub) for those who already have their own hub and want a safe and stylish hideaway to store it in or would rather select their own hub. Like its sisters, its shape and height is identical. It has the spaciousness to manage cord clutter and can shelter any one of a number of hubs. BYOH $39.95 introductory price; $49.95 as of June 1st. All of these products are sold through the Plasticsmith's online store and will be available for shipping on 4/29/05. While we loved the fact that our new Mac minis took up no desk space, we felt that the stark white top of the unit was missing something. 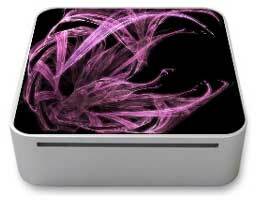 After doing a few skins for them on a whim, we were amazed at the comments we received and figured we had to offer them to other Mac mini owners. 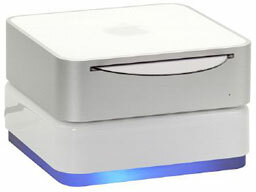 We're proud to offer a line of precision-fit skin kits to dress up your Apple Mac Mini. As with any of our full-color skins, they're all easily removable, washable and reusable and guaranteed not to fade, smudge or smear. We'll also be offering a template soon for those of you who want to use your own artwork. PR: Sonnet Technologies has announced the Tempo-X eSATA 4+4 8-port Serial ATA PCI-X host controller, the latest addition to the Sonnet Tempo line of products. This product replaces the acclaimed Tempo-X SATA 4+4, adding features while retaining the same suggested retail price. New features include eSATA connectors used in the external ports, drive activity LEDs, and hot-swap drive connection support. Like the Tempo-X SATA 4+4 it replaces, Tempo-X eSATA 4+4 offers four internal ports, plus four external ports for connecting SATA drives. The external ports now feature eSATA connectors - eSATA is the emerging standard from the Serial ATA International Organization (SATA-IO) for the external deployment of Serial ATA storage solutions. Designed for applications where swapping drives is required, eSATA connectors and cables offer better shielding for improved EMI characteristics, have better retention than the internal SATA I version, and are rated at 5,000 insertion cycles. High performance and flexibility remain the hallmarks of the Tempo-X eSATA 4+4 - this product utilizes the PCI-X interface to take advantage of the enhanced performance offered in fast Power Mac® G5 computers while retaining compatibility in standard PCI slots. Users can connect up to eight hard drives for up to 4 TB (terabytes) of storage space and can group them in a RAID 0 (striped) array to achieve sustained read/write speeds in excess of 545 MB/s. With the addition of hot-swap functionality, users can change projects and drives on the fly, an especially useful benefit when drives are connected externally. Tempo-X eSATA 4+4 (Part no. TSATA-X44A) is available immediately with a retail price of $199.95. 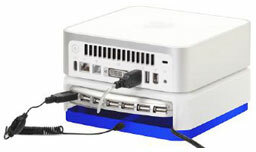 PR: The Tempo-X eSATA 4+4 card's external ports require the use of eSATA data cables. Sonnet offers two kinds of eSATA cables to support the connection of external drive enclosures with SATA I connectors as well as those with eSATA connectors. TCB-SATA-2/1 connects Tempo-X eSATA 4+4 to an external drive enclosure with SATA I connectors. TCB-SATA-2/2 connects Tempo-X eSATA 4+4 to an external drive enclosure with eSATA connectors. Tempo eSATA data cables are available now and are sold individually with a retail price of $24.95. PR: Sonnet Technologies have announced the addition of hot-swap functionality to the Tempo-X family of Serial ATA (SATA) PCI-X host controllers. Tempo-X products shipping from today, including the just-announced Tempo-X eSATA 4+4, support hot-swappable drive connection, enabling users to swap out large amounts of data on single drives and RAID arrays without the need to power down the computer. Customers who have already purchased and installed a Tempo-X SATA host controller may now upgrade their card's firmware to add this new feature. "Sonnet received numerous requests for the addition of hot-swap support," declares Robert Farnsworth, Sonnet president and CEO. "It has been the number one request of Tempo-X SATA 4+4 and Tempo-X eSATA 8 users, and it's been our engineers' top priority for this product line." "Serial ATA was originally designed to support internal device connection, but with its data transfer speed advantage over FireWire® 800, users demanded external connections for SATA drives," states Steve Garceau, Sonnet Product Manager. Sonnet's Tempo-X line addresses the need for external drive support. Hot-swap functionality significantly improves its value. PR: FirmTek, LLC, the leading developer of ATA host adapter solutions for Apple's Macintosh has announced the immediate availability of their newest Serial ATA host adapters: the four-port SeriTek/1VE4 and SeriTek/1V4 external and internal adapters. These adapters join FirmTek's popular line of Serial ATA solutions which include the world's first internal and external Serial ATA adapters for the Macintosh, the SeriTek/1S2 and SeriTek/1SE2, and their award-winning external enclosure, the SeriTek/1EN2. The SeriTek/1VE4 and SeriTek/1V4 adapters offer 133 MHz PCI-X interfaces for the ultimate in Power Mac G5 performance while retaining compatibility with all other PCI-based Macintoshes. They feature direct booting from attached hard drives, hot-swap capability (1VE4 only), support for native Mac OS X RAID 0/1, and work with OS 8, OS 9, and OS X 10.1.5 and later. This adapter offers four external Serial ATA ports that are independently controlled, fully shielded and completely hot-swappable. This design allows for the quick connection of drives to virtually any PCI-based Macintosh for any number of applications, and the hot-swap feature means that multiple users or applications can share the same machine without rebooting between projects. Even a fully operational RAID volume can be unmounted, disconnected, and replaced with another volume without powering the Macintosh down, a FirmTek exclusive feature. This can be especially useful in applications where large video files are being created. This solution employs the same FirmTek quality as the 1VE4, but utilizes internal connections for independent volumes or RAID arrays contained entirely inside the Macintosh. It has the same performance without employing hot-swap capability. With legacy G4 platforms, including most of the "Sawtooth" varieties of Power Macintosh, both of these new SeriTek solutions are limited by bus speed rather than processor speed, which results in impressive performance now that the processor can be fully utilized. While the original Sawtooth machines will often outperform 130 MB/sec throughput, the later Digital Audio, Quicksilver and MDD systems deliver RAID performance nearly equivalent to the latest G5 towers. Given these older systems' greater internal storage capacities, this will be important for many video professionals. "Macintosh users now have the option of adding four high-capacity and high-performance Serial ATA hard drives to their computer with just one adapter," said Chi Kim Stanford, Vice President of Business Development for FirmTek. "Drives can be configured as individual volumes, striped with OS X's disk utility, or configured as high-performance RAID sets using third party RAID solutions such as SoftRAID resulting in amazing performance and reliability." "The blazing performance of our new SeriTek/1VE4 and 1V4 host adapters," continued Stanford, "allow many video professionals to realize the dream of capturing uncompressed high-definition video on a budget." The SeriTek/1VE4 and SeriTek/1V4 adapters offer the key benefits of speed and capacity with remarkable flexibility and ease of service. With drives now surpassing 500 GB each, there are few applications with requirements too extreme for these new SeriTek models. When formatted and controlled by Mac OS X's RAID software, the highest performance drives support the storage of uncompressed high-definition streaming video, which was not easily accomplished on desktop systems before the arrival of Serial ATA. The easy and accessible cabling of Serial ATA drives also makes installing and servicing them a snap when compared to their predecessors. FirmTek's SeriTek/1VE4 external Serial ATA host adapter is priced at $139.95 (SATA-1VE4). The SeriTek/1V4 internal Serial ATA host adapter is priced at $119.95 (SATA-1V4). Specially priced bundles with external enclosures are available. PR: nRAID is the world's first Network Direct Attach 2.5 TB (terabyte) RAID system. nRAID offers the same RAID functionality as eRAID, yet nRAID allows direct connection to any network without the need for IP configurations or expensive servers! nRAID is designed from the ground up for easy expansion and secure data storage and sharing of all your files in a fast, easy, cost-effective and extremely high fault tolerance system. Built-in technology supports aggregation, which allows easy expansion. Just connect nRAID into a wired or wireless network (LAN) switch, install the driver software and simply use it just like a local disk drive on each specified computer. Because NDAS technology allows direct storage connection to the network, the data process path and speed is as durable and fast as a computer's internal storage. Other external network storage devices are more complex, rely on a server, and have longer data processing paths. Ultimately, other solutions experience significant degradation in performance. NetDisk may easily adapt as the central storage unit for all business or entertainment needs. Each nRAID has a unique hardware ID and access keycodes which allow you to specify which computer users have read and write access, read access only or even no access to NetDisk? even though they are all connected on the same network! Also, since nRAID requires no TCP/IP setting, the unit is invisible and safe from external hackers.